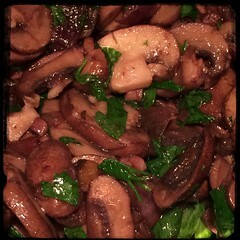 Sautéed mushrooms are a simple side-dish that that goes great with grilled fish, chicken, beef and particularly steak. We prefer Cremini mushrooms because of their slightly more intense and earthy flavor compared to white mushrooms. Cremini mushrooms are actually ‘baby portabellos’ and may also be called brown mushrooms. 1. Sauté onions in 2 tbsp olive oil until showing signs of translucency then add the garlic and hot pepper flakes. Cook until the garlic begins to soften. 2. Add the butter and (optional) bacon fat, toss in the sliced mushrooms and cook until tender. 3. Add a dash of salt and some black pepper and the red wine (optional). 4. let the red wine reduce until reaching the consistency desired.